Samantha And Phyllis. Elizabeth Montgomery as Samantha and Mabel Albertson as Phyllis Stephens,Darrin's mother, in a scene from Bewitched.. Wallpaper and background images in the Bewitched club tagged: bewitched elizabeth montgomery mabel albertson 1960s tv series photo. 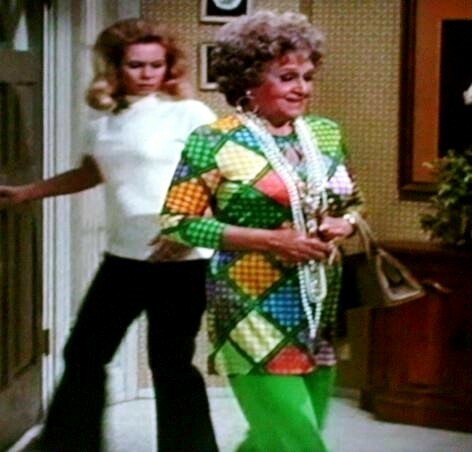 Phylis looks a groovy chick in this scene! Lol, she was going through a middle-aged crisis thing and wanted to modernize. She certainly got what she wanted then Cammie,a modern groovy mamma! I just had to view this again Cammie coz it makes me laugh and cheers me up!Can you remember which episode this is from i would love to see it! It's one of the later episodes. It might be Sam'e Psychic Slip but I'm not 100% sure. Shall check on it and post here. Over and out - LOL! This the episode Samantha's Double Mother Trouble in the 6th season. This is also the ep. where Esmeralda sneezes up Mother Goose. Right thats it! iv'e just got to have it,i'll surf the net or ebay,scan the second hand shops even place an add in the local paper,i won't stop till i get it lol!! P.S my husband thinks iv'e gone nuts coz i carn't stop giggling. I was not expecting that image!